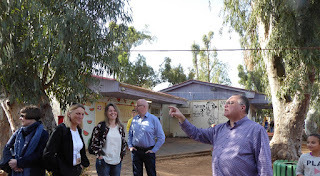 Hadera Democratic School is the very special school for not only for Israeli people but for people in the world. This democratic school is a mile stone school. So many democratic eduation people are inspired and empowered. At this IDEC, tour to Hadera was planed and two days of the conference was held here. This is my third visit to Hadera. The last visit was 2010. Every time I visit here something is different from the previous visit. This time, they have a big new building. People have more rooms and spaces. Surprisingly now they have 600 students. This may be the biggest democratic school of this type. Still they have the long waiting list of 200 children.